Shark Week on Animal Planet is a pretty big deal to a lot of people. Not so much for me. I’m the guy that goes on vacation to Florida and sticks his foot into the ocean and calls it a day (I’ve “been in the ocean” three times. So, I’ve got that going for me…Which is nice.) I know sharks don’t lurk in 2 inches of water, but jellyfish are another story. Anyhow, I think there are some lessons that credit unions can learn from sharks. I’m not talking about feasting on sea lions or instilling fear in people like myself. Instead, I’m talking about the inherent characteristics that make sharks, well, sharks. You’ve probably heard that sharks can’t stop swimming or they will die. This is true of most species, but there are some exceptions. Nonetheless, credit unions cannot afford to stop “swimming”. As an industry we need to continue to make a concentrated effort to further what I will forever refer to as the “Credit Union Revolution.” Every decision we make (I think about marketing and advertising mostly) should be about raising the bar, pushing the envelope and separating ourselves from our brothers and sisters in the banking industry. I am not talking about bank bashing, but poking a little fun here and there has proven to be a tried and true method of getting people to understand that we are different by design. Sharks are cartilaginous. (Personally I just love this word.) An animal that is cartilaginous is defined as one who’s skeleton is made up completely of cartilage. This means that the animal is more flexible by nature. We need to be flexible. This rings true in the things that we already do. A prime example of this is working with our members to understand their situation when they come to us for a loan that they can’t get anywhere else. It goes much further than this though. We should be flexible in the fact that we are one of the “best kept secrets” in the finance industry. Being rigid and sticking to traditional ways of spreading the word about the value of credit union membership simply will not fly. Our world has been rapidly changing for years and we need to be flexible and change with it. Our marketing and advertising efforts need to be different, standout, maybe they need to be a bit outlandish (James Robert Lay has great insights on this. Here is just one of his most recent blogs for CUinsight.) Generally speaking, the smaller size of our respective institutions are the perfect atmosphere for being flexible. We need to enable our employees to tap into the resources we read and rely on for fresh new ideas. Instead of only some of us hearing about the exciting things other credit union people are doing, we need our entire staff to understand that there are a lot of people doing awesome things in the name of “The Credit Union Revolution”. I’m a prime example of this. I think sharks exist to hunt humans. In reality, the number of shark attacks on an annual basis is relatively low. Sharks are most definitely opportunistic. I think the “we” the the torch bearers of “The Credit Union Revolution” could be much more opportunistic. There is no better time than right now (Van Halen reference.) While many of us are wearing many hats at our credit unions, we need to think outside of the branch (thought I was going to say box didn’t you?) How can we carry on the conversations we have everyday in our branches to a wider audience? How can we get the attention of others who have no knowledge or understanding of credit unions? I’ve been fortunate enough to be a part of countless community outreach events and each time, I’ve been able to spark conversations about credit unions. To be honest, I don’t care if it is the credit union that I work at. Don’t get me wrong, I’d love for everyone to join my credit union, but if the person doesn’t qualify, I’m Quick Draw McGraw with my iPhone to tell them about a credit union that can serve them. We are a cooperative. We are unique. We are not sharks, but we should be fierce with passion about our industry. People helping people sounds great, but we are much more than that. We are people helping a population that is mostly unaware of what we can do for them. To me this is the biggest tragedy. Be cartilaginous, don’t stop swimming and make sure we are never misunderstood. Nicely put Bryce! Credit unions could learn a lot from your insights here. It’s easy to never stop swimming, but the challenge for credit unions is what actual stroke (i.e. initiative, strategic move) are they trying to propel them forward! Either way, trying something different for a short period of time and then conducting a post mortem is always a good way to see what may work and what may need adjusting. The key for credit unions starting out is design thinking (something Brent Dixon knows a lot about.) Start small and test small. It should also be said that we must posess the same ferocity as sharks when attacking our initiatives. Whether we’re talking about community outreach, financial literacy education, social media, marketing, biz dev, etc., attack it each with ferocity, purpose, and passion. Those that do so, get noticed. That who don’t, don’t. In honor of Shark Week, CU peeps should pick an initiative at their CU that lacks ferocity, and sink their teeth into it! Should we add Credit Union Shark Week when the time rolls around? What a great post–and all too true! 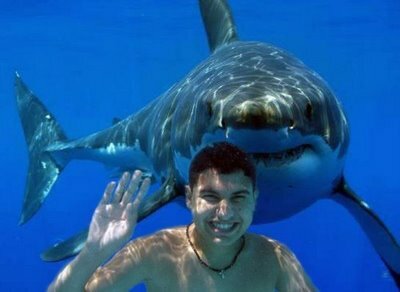 Here’s another way credit unions should be like sharks: when there is blood in the water, we should pounce. That means credit unions should be opportunistic. A case in point was Bank Transfer Day. A lot of credit unions took advantage while others just sat on the sidelines. Credit unions can use a news story as a great public relations hook as well. Let’s look for opportunities to pounce. You bring up a brilliant point about PR. While the concept of content marketing is by no means new in many industries, I feel that we as an industry could do a better job. We need to think like publishers. We need to tell our stories. And we need to do it as often and in as many ways as possible. I am not saying we need to say how great our products and services are. No one wants to hear that. They want, no, need to know how what we do every day creates a positive impact in the lives of our members and as an added bonus the lives of those in the communities we serve. This is fantastic. This should be read by anyone who works in a service center industry. I know that I am going to take these three ideas and applying them to my ministry. Thanks for the exciting ideas. Can’t wait to read more in the future! First of all, it is fantastic to hear from you. Thank you for taking the time to read and I hope that you could take something from the blog. We will have to chat soon. The Life Teen movement here in Oshkosh is amazing! We had a new seminarian speak after Mass last week. He was a former Life Teener at St. Raphael’s in Oshkosh. He was truly inspiring and I couldn’t help but thin, “What a testament to the power of youth ministry.” I know that some day this will happen in Sandusky because of what you do every day! Excellent thoughts here Bryce. I would add to the idea of “never stop swimming”. I think all to often we mistake the passing current for forward motion. Essentially we coast. What do I mean by this? I think as a collective, there are a lot of great new ideas and conversations going on in the industry right now. However, we tend to have this loud cooperative voice when its convenient for a specific cause (I.e.- mbl cap push, interchange, etc.) We tend to be a reactive industry and I think changes need to be made to make us a cooperative-proactive movement. I’d love to see the growing passion I see in our generation keep our unified chant from becoming muddled conversation. We are a reactive industry and having worked in a couple of different places (not CU’s) and for reactive people, I can say that this practice is noxious. It destroys any hope of success slowly from within because essentially you find yourself (or organization) “Chasing its tail”. Even if you ever catch your “tail”, what do you get? I love your enthusiasm. We MUST be proactive. For years our industry has had a mindset that we cannot possibly keep up with the banks. I no longer think that we can use this excuse. We can and we will “keep up”. I believe the key to our success is harnessing our collective energy, voicing our ideas and remaining resolute in our intentions. We’ve got our work cut out for us, but we must (a lot of “we musts” huh?) be willing to learn from curent industry leaders and figure out a way to inject our thoughts and product/service ideas into the marketplace.